A real odd assortment this week, hopefully there's something in here for everyone. Yes, please! They'd look beautiful on my shelf...and desk....and end tables. And everywhere else I leave books to have at arms length. Forty Thousand Sublime and Beautiful Thoughts......enough for a lifetime! Love the assortment in this collection. Would love to add it to mine. 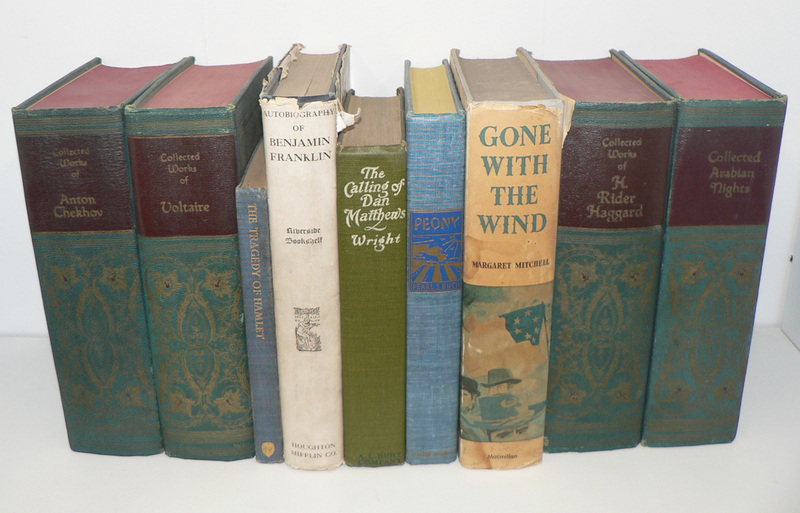 Would especially love the Benjamin Franklin and the GWTW, but love the eclectic selection! Lovely selection of old books! An excellent selection, as usual! 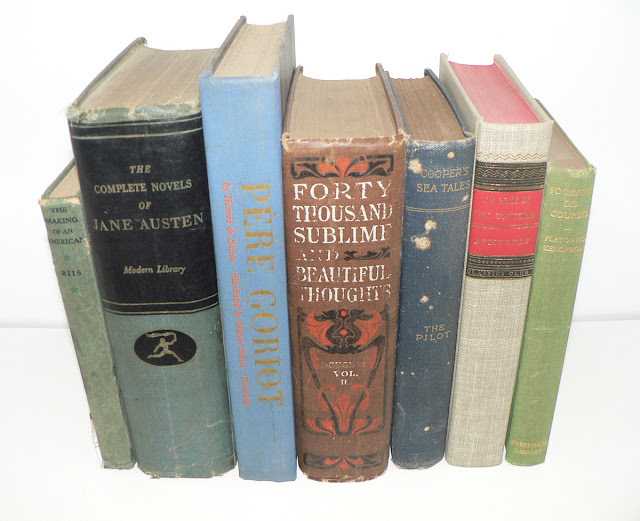 Oh, I would LOVE LOVE LOVE the Gone With the Wind and Jane Austen books the most! WOW! An odd but lovely looking assortment this week! I would like these things! Yum~ what scrumptious choices~~ and yes, I'm the flappy mother hen who scolded you for giving away your beautiful books~ here I am with my hand (wing?) out~ just in case you are forgiving. 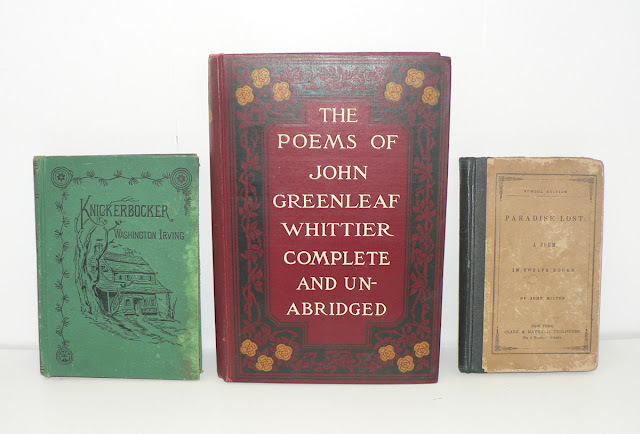 John Greenleaf Whittier! I would love that! A lovely collection! I love the classics! And they are so beautifu1. Nice variety with this giveaway! Odd collection indeed, and it's wonderful! I can smell the pages from here - and I love it. I would love to win these books for...well, me ;o) However, I also want to say I am happy for who ever wins...these are great books! I would love to win! Snuggle in a blankie by the fireplace, and settle in for winter! Great reading! what a great selection! Thank you! What a beautiful set of books! Please count me in for the giveaway! Many bartenders keep guns behind the bar but my dad always kept a few classics to hand out to the bored and lonely. He had Ben Franklin's Autobiography, so I'm glad to see it as a prize. Count me in for this nice set. Looks like some interesting finds! Yes please! What a wonderful selection! Thanks so much for the chance to win! The covers alone look like works of art with treasures within. No tablet/nook could provide that. I love old books. I am intrigued by the Paradise Lost volume. Count me in. Very nice. Enter me plwase! Fantastic selection! Thanks for the chance to win. So many beautiful piece of history! These would be great for my classroom library! Thank you for the opportunity to enter! Ran out of space for more books on my bookshelves long ago...but I wouldn't mind sharing my space with these books! There are definitely some interesting looking books today. I really want to see more of that Forty Thousand Sublime and Beautiful Thoughts ... what a great title! I'm in on this one! Those look like a beautiful collection! I saw the Arabian Nights one and clapped excitedly. Woohoo! What a nice collection to offer. Thanks! Those are some really lovely books--thanks so much for offering them! What a wonderful collection. Thank-you!! These giveaways are rapidly becoming my favorite part of Fridays lol-- not just the chance to win, but marveling at all the cool books you have to give away! I'd love to enter - great selection! My husband built a large bookcase in our living room, which is now our library. And wouldn't these books be a great addition? Thank you for this offer. The books certainly look interesting. Thank you for the chance to,have them in my home. Count me in. Love me some Austen.